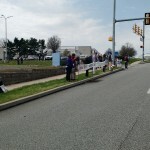 Yesterday (Good Friday), in the spirit of Rabbi Jesus, a group of us assembled once again in front of Lockheed Martin (the world’s largest war profiteer and nuclear weapons contractor) in King of Prussia, PA, to confront the current face of war. Seven of us proceeded to walk up their driveway to carry the message of Christian love to those making possible these wars and destruction. Arrest and a free ride in the paddy wagon resulted. Another option is that if you don’t support these wars, don’t pay for them. Tax day is Tuesday – you can send your full amount that primarily funds these wars, or you can redirect a portion of that money to life-sustaining causes (I do UNICEF and Disabled Veterans of America). CIVIL disobedience still exists and is powerful – it just doesn’t get in the news the way violence does. This was my full NYTimes Comment on https://www.nytimes.com/…/my-first-antiwar-protest.html “Half a century later and we have a new form of endless war. At the same time, peaceful resistance and non-cooperation is as possible now as then. Yesterday (Good Friday), in the spirit of Rabbi Jesus, a group of us assembled in front of Lockheed Martin (the world’s largest war profiteer and nuclear weapons contractor) in King of Prussia, PA to confront the current face of war. Seven of us proceeded to walk up their driveway to carry the message of Christian love to those making possible these wars and destruction. Arrest and a free ride in the paddy wagon resulted. Another option, often done during the Vietnam period, is that if you don’t support these wars, don’t pay for them. Tax day is Tuesday – you can send your full amount that primarily funds these wars, or you can redirect a portion of that money to life-sustaining causes (I do UNICEF and Disabled Veterans of America). 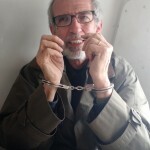 CIVIL disobedience still exists and is powerful – it just doesn’t get in the news the way violence does.” I’m pleased that New York Times was not afraid to publish it.